Hope Van Dyne was instrumental in training Scott Lang and helping defeat Darren Cross, a.k.a. Yellowjacket, in Ant-Man, but unlike Scott, she never got to put on a superhero costume in the film. Despite repeatedly requesting her father to give her a shot at wearing the shrinking suit, Hank Pym refused in order to keep her safe. Fortunately, in the mid-credits scene, he changed his mind and revealed a new Wasp suit that was made specifically for her. This confirmed that Marvel is planning to have Hope inherit the Wasp legacy from her mother Janet, but oddly enough, Evangeline Lilly hasn’t actually worn the costume yet. 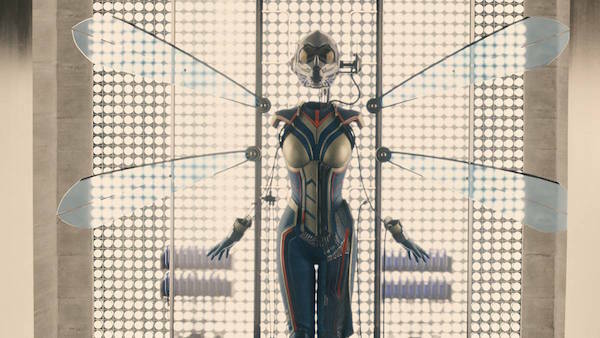 During a Facebook Q&A on Monday, Lilly revealed that she was scanned for the Wasp suit during production on Ant-Man. However, she got pregnant before she could put on the suit and still hasn’t had the opportunity to try it on for size and take it out for a spin. Since there’s no word yet on when we’ll see Hope in the MCU next, it may be a while until Lilly gets the opportunity to put the costume, but maybe Marvel will check back with her at some point to make sure the measurements are still accurate. Although Hope didn’t get to become The Wasp in Ant-Man, we did get a little Wasp action in a flashback to Hank and Janet’s last mission together. Janet shrunk herself smaller than ever before in order to disarm a Soviet missile heading for the United States, and while she was successful, she inadvertently kept shrinking and was subsequently lost to the Quantum Realm. Fearful of losing his daughter, this is why Hank wouldn’t let Hope don the Ant-Man suit, but after seeing her help Scott stop Cross, he showed her the advanced Wasp suit he had been developing with Janet before her "death." Hank says he believed the suit was for his wife, but eventually realized that they had been designing it for is daughter. Needless to say she was pleased with this, responding, "It’s about damn time!" As for when we’ll see Hope become The Wasp, that still remains a mystery, although Marvel president Kevin Feige has already ruled out an appearance in Captain America: Civil War. The logical answer would be Ant-Man 2, but Marvel hasn’t announced when, or even if they’ll make that. Another possibility may be that Hope will make her superhero debut in one of the Avengers: Infinity War movies, since that is expected to feature most of the major Marvel heroes going up against Thanos. We’ll keep you apprised on any development regarding Hope’s future as Wasp, but this is one superhero that many Marvel fans would like to see sooner rather than later.